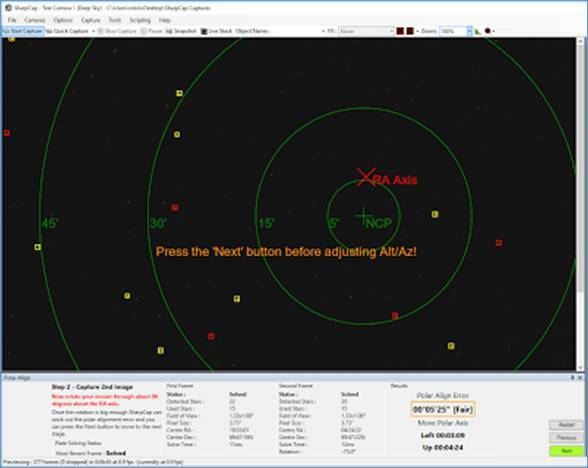 SharpCapPolar Alignment is designed to help astronomers achieve excellent polar alignment quickly, easily and reliably. The idea was inspired by the PhotoPolarAlign application created by Themos Tsikas. Themos has been kind enough to help with testing and suggestions during the development of the polar alignment feature in SharpCap. The Polar Alignment procedure can be started from the Tools menu. 1. The exact area of sky represented in each image - this process is called Plate Solving. SharpCap has a built-in plate solving algorithm that doesn't need an internet connection or any other program or database to be installed. SharpCap's plate solving only works within 5 degrees of the pole though (N or S). 2. The centre of rotation about which the stars seem to rotate when going from the first to the second image. Since SharpCap has worked out exactly what RA & Dec the telescope was pointing at in each image, it knows where in the image (or perhaps how far off the image) the celestial pole is. SharpCap also knows the point about which the stars seem to rotate - that's where the mount’s RA axis is currently pointing. If those two points are the same, the polar alignment is perfect. If they are not the same, all that is required is to adjust the Altitude and Azimuth adjusters of the mount until they are the same point and that will complete polar alignment. SharpCap will guide through this process with on-screen instructions, including a live update of how far is still needed to move the mount in each direction to get perfect alignment. · A camera supported by SharpCap combined with a telescope/finder-scope on the mount. · A field of view in the camera of between 0.5 degrees and about 2.5 degrees. · Able to see at least 15 stars in the field of view. It is not required to have perfectly aligned the guider scope or main scope as the polar alignment process is not affected by this sort of misalignment. The stars SharpCap is using to perform the plate solving are highlighted in yellow, other stars are highlighted in red. The North (or South) celestial pole is shown and circles of different radii are shown around it. Note that the pole may be out of view - don't worry if it is, carry on to the next stage. 1. Not enough stars detected. 2. Too far from pole. 3. Field of view too large or too small. The last two require physical changes to be made to the setup, but the first might be fixable by adjusting the star detection parameters at the bottom of the screen or by adjusting the exposure or gain of the camera in use. If the stars are too faint, try turning up the exposure, gain or digital gain. If hot pixels or noise are being picked up as stars, try turning up the noise reduction control. Once the first frame is solved, press the NEXT button to move to the next stage. After pressing NEXT, rotate the RA axis through about 90 degrees. Do this either by unlocking the RA clutch or by using the mount's GOTO system if it has one. 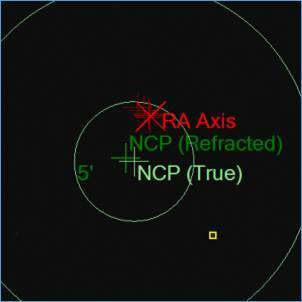 At this point, SharpCap has calculated the position in the image that the RA axis is pointing at - this is the point around which the image appeared to rotate. The RA axis point might be out of view, so don't worry if it doesn't show up, so long as the 'NEXT' button becomes enabled. If the 'NEXT' button is not enabled, try different amounts of rotation (or rotating in the opposite direction). If that still fails, it is likely that not enough stars are being picked up in the rotated position - the best way to fix this is to leave the mount in the rotated position and press the 'Restart' button to go back to the start of the alignment process. This leaves a view of the rotated position with the star detection controls available to play with until a plate solve can be achieved in that orientation. DO NOT ADJUST THE ALTITUDE OR AZIMUTH UNTIL NEXT HAS PRESSED TO MOVE TO THE FINAL STAGE. All that is required to get good polar alignment is to move the indicated star into the target - doing this will also line up the NCP with the RA axis and polar alignment done. At the bottom of the screen, below the Polar Align Error figure are some guidelines indicating which direction the mount needs to be moved. These are calculated based on the estimated longitude which is calculated from the offset between the local time and GMT, so they are not exact. During the adjustment phase the highlighted star might switch to a different one - no need to worry, just keep adjusting. As this gets closer the arrow and target changes to a pair of parallel lines that need to be brought together to finalise the alignment process. If it is found that the length of the arrow isn't updating, or is only updating now and then, it is likely that the plate solving isn't working for every frame - either ignore the problem and just get the star into the target or alternatively try further tweaks to the gain or exposure to get the star detection and plate solving working more reliably. That an alignment error of under 2 minutes of arc is considered good and under 1 minute of arc is excellent. Do not waste time trying to get the alignment error all the way down to zero. · Try using a guiding camera (such as ZWO120MC, QHY5LII, Altair GPCAM and others) with a ~200mm focal length finder-guider - this will give the correct field of view. · Read the on-screen instructions - they will walk through the procedure. · Select a high gain and an exposure of 4-8s - this should let SharpCap see enough stars. · If the mount is on a pier, the pier mounting plate bolts can often give finer adjustment than the mounts own alt/azimuth adjusters. · Don't worry if the scope or finder is aligned with the mount correctly - misalignment won't affect the result. · SharpCap needs to know the approximate longitude to work out which direction (up/down/left/right) the mount needs to be moved. If the time zone is set incorrectly, the wrong directions may be suggested. The information below should help you resolve a number of commonly encountered problems with the polar alignment tool. No matter how much I adjust I can’t get the error down to zero! STOP!!! You don’t need to get the polar align error down to exactly zero and you are wasting clear sky time if you try! A polar alignment within 1 arc minute of the pole is usually considered to be excellent and good enough for long exposure imaging. Stuck at the first Step? The ‘Next’ button never becomes enabled? Getting stuck at this stage means that SharpCap can’t plate solve the view from the camera and work out where near the pole the camera is pointing. The most recent frame status will be ‘Could Not Solve’ in red all the time and the First Frame Status will be ‘Working’. Sometimes you will find that you will eventually get past this stage if a frame from the camera happens to be a bit better than the others and plate solves – don’t be tempted to move on if that happens as you will get stuck further on – fix the problem by running through the troubleshooting steps below instead. SharpCap has a star database out to 5 degrees away from the pole (7 degrees in SharpCap 3.1). If the image is taken of an area further from the pole than this then plate solving will fail. If you have a network connection, you can check how far you are from the pole by saving a frame (press the ‘Snapshot’ button) and uploading it to nova.astrometry.net for plate solving. If you have a plate solving tool installed on your PC you could use that instead. Some cameras suffer from hot pixels (pixels which have maximum value even though no light falls on them). With some star detection settings, single hot pixels may be detected as stars. If enough of these hot pixels exist and are detected, they may confuse the plate solving algorithm. 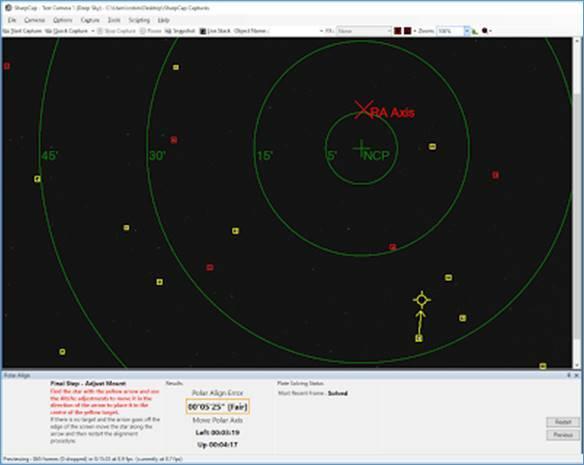 SharpCap 3.1 and above will show a warning below the star detection options if the combination of options mean that hot pixels would be detected as stars. You only need to worry about this if your camera is prone to hot pixels at the exposure/gain settings you are using. You can stop hot pixels from being detected by increasing the noise reduction setting, increasing the minimum star width or reducing the digital gain. Once you have made adjustments to your telescope or moved SharpCap on to a new step in the polar alignment process, you shouldn’t have a long wait to see the results or for SharpCap to find a solution – a few seconds or so is typical. If you find yourself waiting more than 15 seconds then something isn’t right and the most common cause is that SharpCap is not able to plate solve every frame that is coming from the camera – in fact it might only be solving one frame in 10 or even one in 100. This problem is easy to spot because the ‘Most Recent Frame’ status will be ‘Could not solve’ in red most of the time, but will change to a green ‘Solved’ every now and then. This problem has exactly the same causes as the problem of being stuck at step 1 above. The best solution to this problem is to restart the alignment process and follow the suggestions above until the ‘Most Recent Frame’ status is showing as ‘Solved’ for every frame. Note that sometimes you find this problem occurs for Step 2 even though you had a good solution straight away for Step 1 – this could be because the rotation around the RA axis has moved the camera to point to an area of sky that is harder to plate solve (perhaps fewer bright stars). 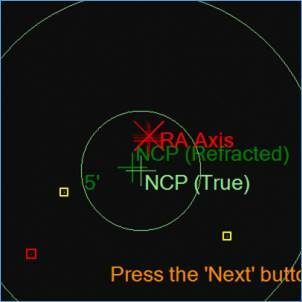 A good trick for this problem is to leave the RA axis rotated but reset the SharpCap Polar Align routine back to Step 1 – then adjust the camera settings and star detection settings to get good plate solve in the rotated position before continuing the process by rotating back to the home position. I get the wrong results – SharpCap says my Polar Alignment is great after adjustment, but it isn’t! The first thing to check is that you have pressed the ‘Next’ button to move to the adjustment stage before you started tweaking the Alt/Az of your mount. If you don’t move to the adjustment stage then you will get incorrect polar alignment. 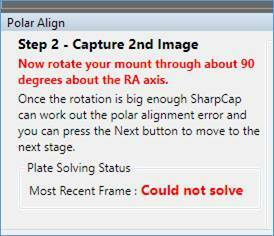 Update to SharpCap 3.1 which improves polar align to make this common slip up much harder to make. The next most common cause of this is that something is shifting as the mount is being rotated around the RA axis. If you are using a guide scope/camera it could be that the scope is not mounted firmly or that a cable is pulling (or just hanging loose) which can shift the camera slightly. This problem has also been experienced by people who have a problem with their RA axis bearings! The first thing to do if you suspect this problem is to confirm you have an issue. Run a SharpCap polar align normally (starting in the home position and rotating 90 degrees), and adjust as usual. Once you are finished, leave the scope at the 90 degree position and re-run polar alignment in SharpCap (this time rotating back to the home position when prompted to rotate). If the measurement from the second PA run matches the first then you probably don’t have this issue. If it doesn’t match by a big margin then flexure/movement as you rotate is the likely cause. In SharpCap 3.1 you can test for this problem quite easily by rotating the mount in stages of about 15 degrees. 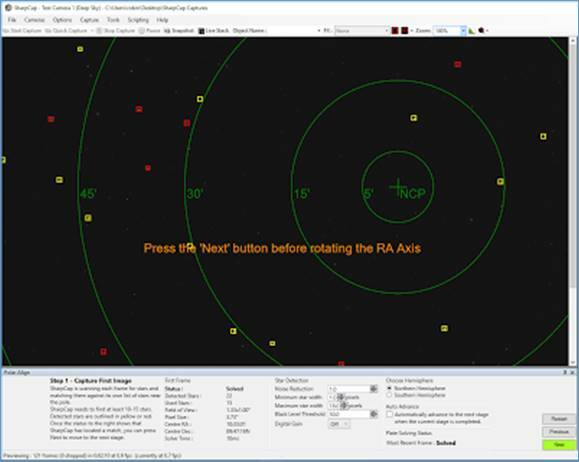 SharpCap plots a dark red cross at the point it calculates to be the center of rotation (where the RA axis is pointing) for each stage of the rotation – these should form a tight group on screen if there is no flexure. In the screenshots below I deliberately let the cable to the guide camera hang loose for the polar alignment run shown on the left. Here you can see that the measured RA axis positions have drifted as I have rotated further due to the weight of the cable pulling on the camera. Once the cable was properly secured the RA axis positions form a much tighter group. If you discover that you have problems with flexure when rotating you can obviously try the usual hardware fixes of tightening all connections and securing all cables. Another possible trick that can help is to run the two steps of the polar alignment at about 30-40 degrees left of home and 30-40 degrees right of the home position. Depending on how your equipment is configured there may be less flexure when using this approach because the scope is largely ‘up’ during the hole procedure rather than going from ‘up’ to ‘sideways’ after rotation. Firstly, make sure that you have pressed the ‘Next’ button to move onto the adjustment stage before adjusting the mount Alt/Az. If you start adjusting before pressing the ‘Next’ button then your final alignment result will be incorrect and the direction indications (up/down/left/right) will not appear to work correctly. If you are using SharpCap 3.0, update to SharpCap 3.1 which only shows the direction guides after pressing next to avoid this problem. Secondly, remember that the directions given are assuming that you are looking at your mount and you are facing in the direction of the pole (ie the telescope is pointing away from you at the pole). An instruction to move up means ‘move the mount altitude so that the objective end of the telescope is pointing higher up’, while right means ‘move the mount azimuth so that the objective end of the telescope points further to the right (east for NH. west for SH)’.